There is nothing more Iberian — meaning Spanish, Basque or Portuguese — than the combination of shellfish and pork. Anyway, it’s a damn good plate of food, and fun to eat. 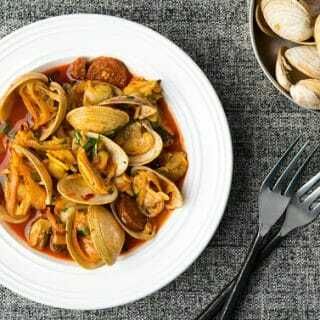 The double hit of savory umami from the chorizo and clams, tartness from lemon juice, saltiness from both the broth and the sausage makes this dish a classic for a reason. I foraged my own clams at an Undisclosed Location on California’s North Coast, and made the Spanish chorizo myself, kinda-sorta following the recipe from Charcutería: The Soul of Spain. You can of course buy your clams and your chorizo. Much easier. If you do buy your clams, buy them at a place that sells a lot of clams. In most cases this is not your grocery store. Clams can live several days out of water, but they will die eventually. Gaping clams are not necessarily dead, either, but gaping clams that don’t respond when you tap them probably are. Turnover is key. When I am forced to buy clams for cooking events I do, I get the fishmonger all pissed off by requiring him to set out the clams so I can touch them. I then tap each one that’s gaping, and if they respond I take them. And yes, I usually apologize to the person in line behind me. If you collect your own clams, be sure to purge the sand out of them first. I wrote a tutorial on how to get sand out of clams, so you can follow that. My final piece of advice to get the most out of this recipe is to do your best to get real Spanish pimenton, the smoked paprika they use a lot, and to get the best loaf of bread you can find. And please don’t slice your bread all dainty-like: Tear it into pieces as you eat, using it as a “spoon” to get yummy things onto your fork and to soak up the fantastic broth. Eating a bowl of clams should be primal, and the torn bread just seems more natural. I use Western littleneck clams for this recipe because that's what I can forage for here in NorCal. You could use any small hardshell clam, and Manila or Eastern littlenecks are just as good or even better than then Western clams I use. As for the chorizo, just be sure to get hard, Spanish chorizo, not the soft Mexican variety. You can get this sausage in specialty shops, and you can buy it online. Smoked paprika is important for this recipe, but you can use any sweet paprika if you can't find the good stuff. Lay the clams in a wide pan, like a big frying pan, in one layer; you may need to do this batches. Pour 1 cup of white wine in the pan and turn the heat to high. Cover the pan and steam the clams open. Keep an eye on the pan and check every minute or two and remove each clam as soon as it pops open. Move the opened clams to a bowl. Keep doing this, adding and removing clams, until they are all opened. Tap on the shells of those clams that don't seem to want to open, and sometimes they'll pop. If they stay resolutely closed, toss them. Your choice here: I remove all but a few of the clams from their shells because it's easier to eat this way; I leave a few clams in the shells for garnish. Some people just like to pick through the whole shebang, and if you're one of those, go for it. OPTIONAL: Strain the clam juice through a paper towel to remove grit. You can use this for the finished dish. Wipe out the pan you cooked the clams in and heat the olive oil over medium-high heat. When it's hot, saute the onions until they are soft and the edges have browned a bit. Add the chiles, garlic and chorizo and cook for another minute or two. Crumble the saffron over the pan and sprinkle the paprika over everything. Add the remaining white wine, the clams and enough of the strained clam juice (or water) to halfway cover everything. Boil this furiously for about 90 seconds. Turn off the heat, add the lemon juice, chopped herbs and black pepper. Serve at once with a big loaf of crusty bread. I like to eat this with good bread and a dry rose or a very light red, like a Spanish Garnacha, California Gamay or French Beaujolais. Hard cider is another good choice here, as would a full-flavored white wine like a Spanish Verdelho. 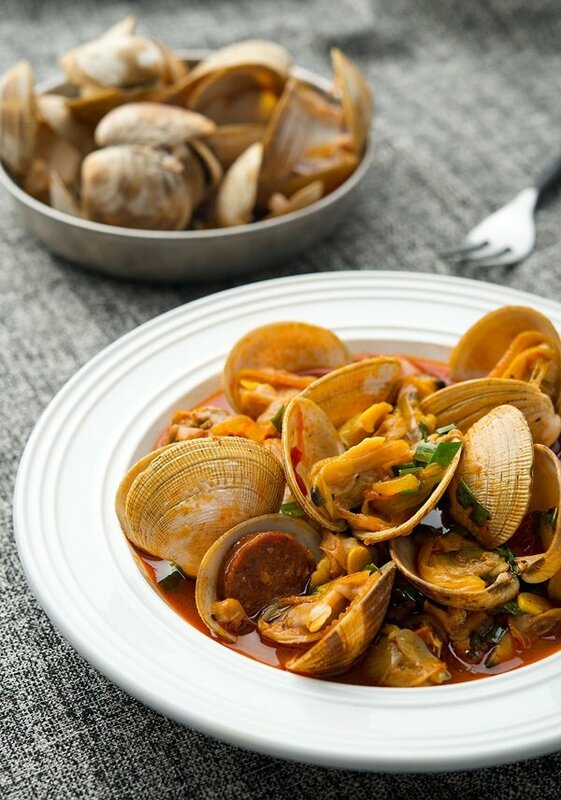 You can find dozens of recipes for clams and other shellfish here on Hunter Angler Gardener Cook! Nope, there is no blanket health advisory here. You do need to call the shellfish hotline just in case there is a temporary closure in your area, though. 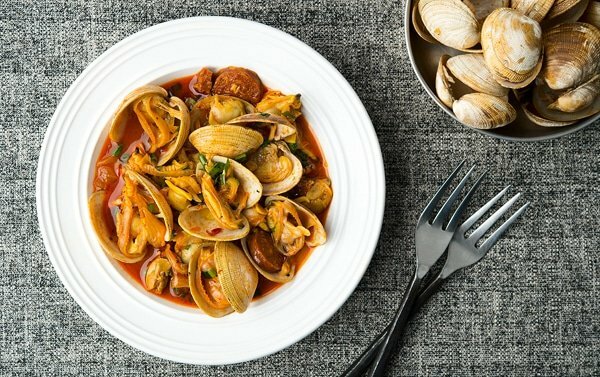 I am really a fan of seafood and these clams are just amazing! 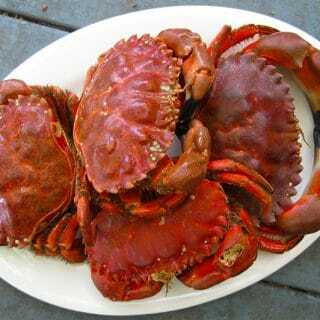 I also agree that shellfish and pork brings out great flavors! Thanks for this dish! Delicious doesn’t do this recipe justice! I bought Manila clams at my local excellent seafood purveyor and invested in good quality dry chorizo. The saffron is a must. I brushed thick slices of baguette with olive oil and a little salt and “grilled” them on my stovetop in a nonstick pan. I confess I thought it was too much trouble to remove the clams from their shells. So I sautéed the onion, garlic, chorizo, etc. first and then added the wine (infused with saffron a few minutes prior) and brought it to a boil, and then added the clams and cooked them over moderate heat for about 5 minutes. Next time I will try the recipe as written, just to compare. Used cilantro and it fit perfectly with the other flavors. One last thing: I zested the lemon and added to the mix. Really fantastic.